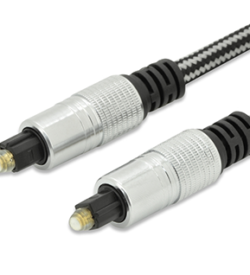 Audio cables | View our catalogue products | SiliconBlue Corporation Ltd. Audio connection cable, Toslink, M/M, 2.0m This digital fibre optical audio cable connects in an easy way, e.g., Blu-Ray player or SATReceiver to an A/V-Receiver or HD TV. Cotton jacket for protection against mechanical pressure. LWL, UL, si/bl, gold. 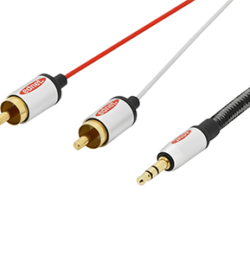 Audio connection cable, Toslink, M/M, 3.0m This digital fibre optical audio cable connects in an easy way, e.g., Blu-Ray player or SATReceiver to an A/V-Receiver or HD TV. Cotton jacket for protection against mechanical pressure. LWL, UL, si/bl, gold. 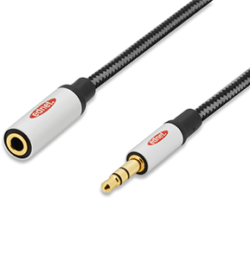 Audio connection cable, stereo 2x RCA, St/St, 2.5m High sound enjoyment with stylish design, CCS, shielded, UL, si / bl, cotton, gold. 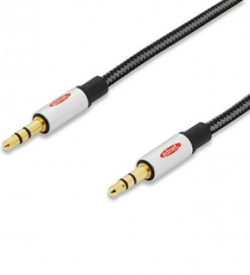 3.5 mm stereo connection cable for connecting eg MP3 player or smartphone via the RCA inputs on your stereo.